How did you break into beach volleyball? Take us through the overview of your volleyball career. I started with indoor volleyball when I was ten. At 14, I left my hometown and family to live in Sao Paulo (one of the biggest cities in the world) to play for a top beach club. At age 15, I made the Brazilian Junior National Team. At 20, I was playing overseas in Belgium and at 21 I came to the US on an indoor scholarship. My indoor career was great but I had my eyes on the beach since I was 18. As a sophomore, I transferred to California so I could start training at the beach. I played my first beach tournament in 2006 as a goal for rehabbing from my first shoulder surgery. The tournament went well but the shoulder needed a second surgery and I went back to the beach only in 2009. In 2011, I went to Brazil to train and improve my game on the Brazilian tour. In 2012, I moved to Florida and started Bevolley Academy. This was an opportunity to train with other pro players and juniors. At the time, training for beach volleyball was difficult, as the quality of coaching was almost impossible to find. I was lucky enough to have my Brazilian connections and use those in Florida. In 2014, I started playing FIVB and played until the European Olympics of 2015. After that, I decided to come back to the US and play the NVL 2015 season! Was beach volleyball popular in your home country? Beach Volleyball has always been really popular in Brazil. Do you have any family members that played? Do you come from a family of athletes? My mom played a little volleyball during high school, but besides that nobody else in my family had any volleyball background. My dad’s family is not the “sports type” – but in my mother’s family, most of my uncles played soccer. One of them even represented Brazil’s national soccer team at the Olympics in Rome 1960. Was your family supportive of you decision to play professionally? Were there any struggles? My parents were never really the over-protective type. Since I was young, I had the freedom to go after the things that interested me. My family’s biggest decision was when they allowed me to leave home at age 14 for volleyball. That was really difficult and to this day I still can’t believe they actually allowed me to go. I think they thought I would come back home after six months, but I adjusted well and never returned. The transition to play professionally was normal – and in a sense, expected. Sometimes it amazes me to see that parents in the US are so crazy supportive! Were there any times that you doubted your decision? Nothing is easy in Brazil, but I never really doubted my decision. Volleyball has always been my passion and I really can’t imagine myself doing anything else. To this day, if I am not playing, I am coaching or involved in volleyball/beach volleyball projects. It is where my heart is and I hear I am a very passionate person (laughs). Tell us about your experience playing FIVB and the European Olympics. It was a good experience to play the FIVB, traveling around the world to compete at the highest level and meet so many people doing the same thing. The European Olympics was just incredible and I am so thankful that I was able to experience an event of that caliber. I cannot imagine what the real Olympics would be like – probably three times bigger. It was in June of 2015. Training at that level is intense – everyone playing on the world tour is a full-time athlete. When I decided to play FIVB, I was invited by Vivian Cunha to be her partner and our goal was to qualify for Rio 2016. Due to some transfer problems we weren’t allowed to play together, which crushed both of us. Not having my competitive partner was really difficult and ultimately why I decided to come back to the US full-time. What made you decide to start playing on the NVL? What has your experience been like so far? What are the benefits to playing on a tour like the NVL? After one year of traveling and living with Vivian, but getting on the court with different partners, Vivian and I were crushed. We really wanted to play together and the NVL gave us that opportunity. The experience was great (we won 4 out of 6 tournaments) and everyone on the tour was very kind from day one. It felt really good from the day we passed our first qualifier and being introduced to all the main draw players. You can tell that the NVL tries to create an environment where all the players feel included and important. I am very thankful to Al-b, Molly and The NVL for giving us the opportunity to play on the tour and to all of the players for the great competition on the court and friendship off the court. What do you do during off-season? I work at my Beach Volleyball Academy in St. Pete (Bevolley Academy) but I always make time to travel. I love traveling, visiting friends and getting to know new places. This past off season I took two months to go between Europe and South America and it was incredible. I have a hard time saying no to traveling. You just battled some serious medical conditions. How are you doing? Yes, I had a rare case of Hepatitis A and was really close to losing my liver but thankfully my body fought back and three months later I am almost 100% again. Has it affected your pre season training? It certainly affected my training. Normally, I take a ball break during the off-season but continue going to the gym and exercising so I don’t completely lose my conditioning. This season, I lost a lot of weight and all of my conditioning after being in bed for almost three weeks. Putting the weight back on was easy, (because I love to eat) but I had to delay my pre season. I am just now about to start with physical training. At this time, I feel that I don’t necessarily need as much ball touch during pre season, but I still need to get my conditioning back. Luckily, the season will start a little later this year and I will have a good six weeks to regain a big part of that. Last season, you played with Vivian Cunha and dominated 4 out of the 6 tournaments. This season you will be playing with Kaya, another high ranking NVL player. Are you looking forward to this? What should we expect to see? I am looking forward to be playing with Kaya. She is certainly one of the strongest players on the tour and I am very confident that we will be fighting to be the number one team on the tour this year. You can certainly expect some fire and aggressiveness (as it is a characteristic that we both possess). What are your strengths on the court? What are Kaya’s strengths? What can you learn from Kaya that will help you to keep your #1 spot? I like to think I am a very strategic player, I really like the cat and mouse game. I have strong fundamentals and ball control which helps with consistency. Physically, Kaya is a monster – offense comes really easy for her (serving, hitting, blocking) and her game is really solid at the net. She is aggressive and she is a great competitor, but remains calm and collected when things are boiling – which is important for the beach game (and for me and my Brazilian blood). What do you expect for the future of the sport? In the US, Beach Volleyball is certainly growing like crazy, as it is now a full collegiate sport. The commitment level is a lot higher and people are slowly figuring out how to implement serious training regiments for the sport. It is no longer just a recreational game so the level of play is quickly improving. This is really exciting and I think the sport is finally taking off. I am glad that we have all the professional leagues in the US to accommodate the high demand of new players and fans. I hope sponsors are capable of seeing this and invest more so players can commit more to playing and can make a living. 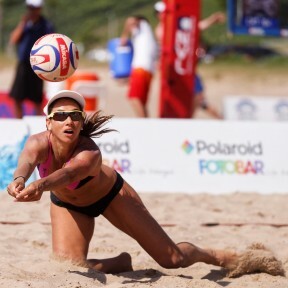 Beach Volleyball has everything to become one of the favorite sports in the US. World-wise, there are more and more countries adopting and heavily investing in the sport. I guess it is a fun sport to practice but also so much fun to watch besides the lifestyle that comes with it.